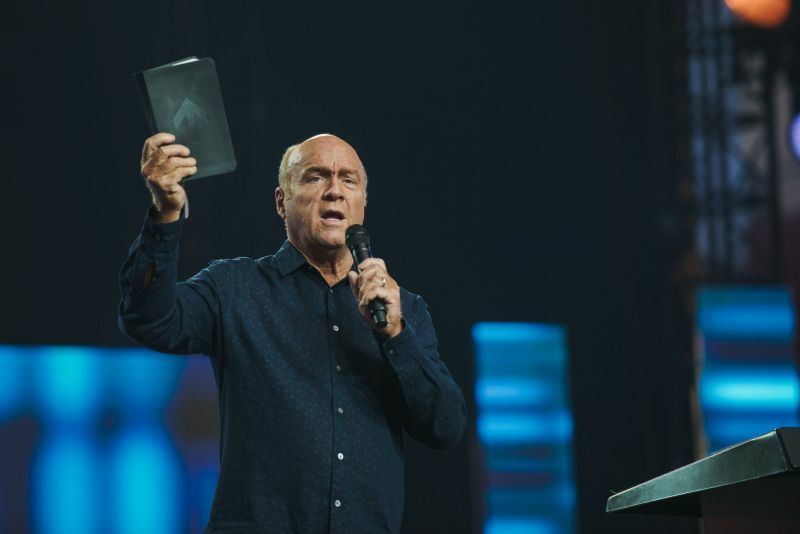 During his sermon on Sunday, popular California evangelist and megachurch pastor Greg Laurie provided his thoughts on the roles that angels play in the lives of Christian believers and whether or not people have "guardian angels." Laurie, the senior pastor of Harvest Christian Fellowship in Riverside, gave a message titled "Angels in the Life of the Believer" in which he used the Old Testament prophet Daniel and Apostle Peter as examples of how God protects those who walk in His shadow. "Angels are involved in the life of every Christian," the 65-year-old pastor and author told his congregation. "We don't understand how many times angels have stopped us from doing something we should not have done or gotten us out of tight situations or protected us from harm. There might even be times that angels have spoken to us." Laurie cited Psalm 34:70 to state, "The angel of the Lord guards all who fear him and he rescues them." "This happened for Simon Peter. He was arrested and he was going to certainly be put to death because James had already been executed by King Herod," Laurie said. "There he was in jail. Acts 12 tells us that the Church began to pray. Constant prayer was offered to God for him and an angel was dispatched from Heaven and the angel walked right into that prison cell. Peter was apparently a deep sleeper because the Bible says the angel had to smite him to wake him up." "The doors opened up for the prison cell just like in the supermarkets. Out Peter walked. The point is the Lord sent an angel to do that." Laurie asserted that there are around 300 direct or indirect mentions of angels in the Bible. "They have this special work that God has called them to do," he said. "Hebrews 1:14 says that they are ministering spirits sent to serve those that are heirs of salvation." Laurie stressed that there are times when angels are sent to intervene in our lives in different ways. "It is even possible that you have met an angel," he said. "Hebrews 13:2 says, 'Don't forget to entertain strangers for in doing so some people have entertained angels without knowing it.' So look around right now and look next to you. There could be an angel." Angels are "all around us" and act like "God's secret agents" to carry out covert missions, similar to the Army Green Berets or Navy Seals, he added. "They are often engaged in missions we never hear about but they go and do the work that they are called to do. They are deployed to take care of something and they accomplish that task and return. We don't even know who did what. We just know the job is getting done. That's angels. They are not there to draw attention to themselves. They are there to do the work of God." Laurie pointed out that many believers wonder, "Do we have guardian angels?" "I don't know the answer but I think it may be yes," the pastor explained. "I think it may be that children have guardian angels. I don't know about adults. I say that because in Matthew 18:10, Jesus said, 'Don't look down on one of these little ones ... for I tell you their angels in Heaven always see the face of my Father in Heaven. So maybe children have guardian angels." Laurie again referenced Acts 12, this time pointing to the part where the believers in the Church were praying for Peter's freedom. When Peter knocked on the door during their prayers, the group was initially shocked that their prayer was answered so fast that one of the believers even exclaimed that it might be Peter's angel. "Sometimes we pray for something and God answers our prayer and we are shocked to find that He answered it so quickly," he said. "But it is interesting that they said, 'It is just his angel.' So maybe we have guardian angels. But even if we don't have specific angels assigned to us, we know that we have angels all around us." The California pastor also cited Psalm 91, which explains that "God will command His angels concerning you to guard you in all your ways, they will lift you up in their hands so you will not strike your foot against a stone." "So God will do His part and you need to do yours," Laurie said. Psalm 91 also states that "whoever dwells in the shelter of the Most High will rest in the shadow of the Almighty." "Have you ever tried to walk in someone's shadow? You have to be very close, don't you?" he asked the audience. "If I am in the shadow of the most high, that means I am staying very close to the Lord, bringing me to my next point. Daniel stayed close to God and never stopped serving Him." "Look at [Daniel 6:19]. The king [Darius] comes to the den of lions and says, 'Was your God whom you served so faithfully able to rescue you from the lions?' In another translation it is, 'your God whom you have served continually.' So even Darius, a pagan king, recognized that Daniel served the Lord constantly and he had this angelic protection around him as a result. So the objective in our life is to stay close to the Lord and trust the Lord and never test the Lord." Laurie assured the church that "the Christian is indestructible until God is done with him." "You are indestructible, so stop worrying about everything. We worry about our diet. We worry about how old we are. We worry about this and we worry about that. Worrying doesn't help anything and it makes things worse. But just understand that your days are numbered by God and you will live to the end of those days that God has set out for you and nothing will stop you from that. Rest in that truth, it is a great thing to know."